I will never forget my first visit to a cruise ship late-night chocoholic buffet. I had never seen anything like it – and I’m not talking about the food. The place was mobbed with excitable passengers juggling plates piled high with calorie-filled creations while grabbing whatever they could from the mouth-watering display. For me, this fulfilled the stereotype of cruising where you can pile on a pound a day by indulging in cooked breakfasts, full-on lunches, blow-out dinners – and everything else in-between. But such all-out gluttony was starting to leave something of a sour taste among passengers and making cruise lines conscious that this wasn’t the healthiest of images to promote. It was time to ditch the junk diet, or at least offer an alternative, so the cruising world took strides to offer more nutritious options and raise awareness of eating more wholesomely. Healthy recipes started to appear on menus and now dishes containing less salt and/or fat are routinely highlighted along with low-sugar desserts by mainstream cruise lines. 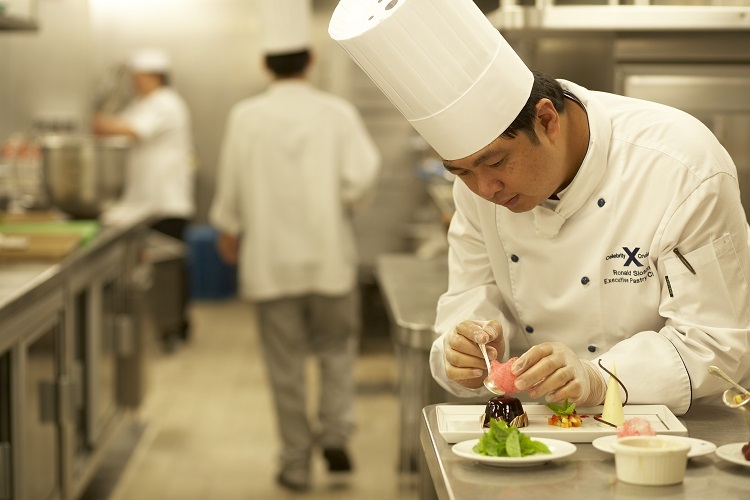 In general, various dietary needs including vegetarian, vegan, gluten-free and diabetic are catered for on ships. Recent years have also seen the emergence of sushi restaurants, spa cafes and juice bars, while some cruise ships have dedicated healthy eating venues. Celebrity Cruises’ Blu restaurant on its Solstice-class ships was accredited with being the first such facility and can now be found on several of its vessels. Reserved for passengers staying in spa cabins, it serves so-called ‘clean cuisine’ which focuses on grilled meats served with vinaigrettes and light sauces. 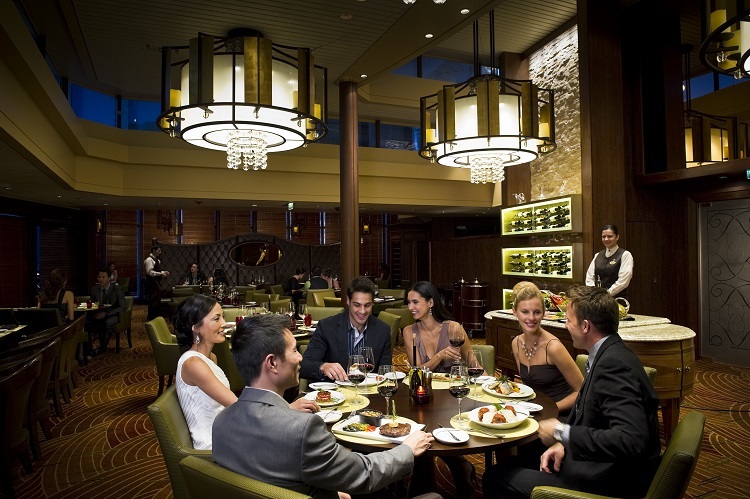 Royal Caribbean International’s Oasis-class mega-ships have two venues focusing on low calorie dishes. The first is the Vitality Cafe in the spa which serves up smoothies and snacks that include wraps, fresh fruit and yoghurts. A second healthy venue is the Solarium Bistro, where passengers can grab light breakfasts and lunches and, for a fee, enjoy healthy meals where dinner ranges from risottos and salads to soups and fish. But the joy of steering away from fatty foods is the appearance of the unexpected! For instance, if you want a six-course fine-dining experience, chef Curtis Stone and Princess Cruises have combined the ultimate in flavour with fresh cuisine and delicious discovery. 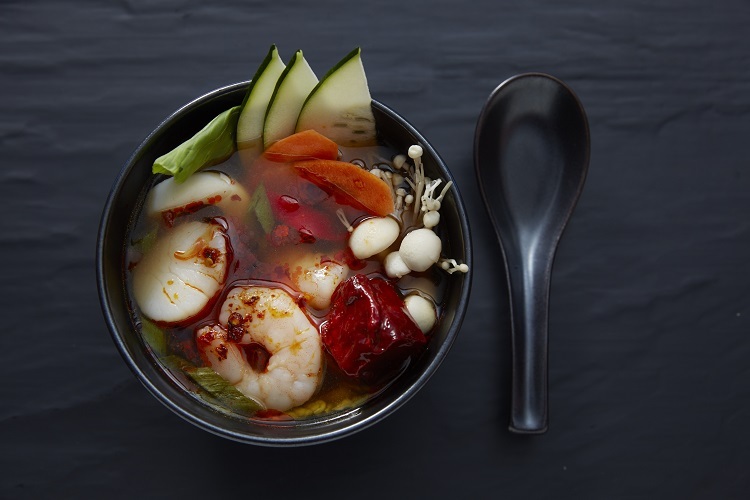 These dishes are inspired to ignite passenger’s senses and help them explore new tastes. For a local feel, Norwegian line Hurtigruten even has a ‘Norway’s Coastal Kitchen’ initiative whereby it sources ingredients from its ‘pantry’ of Norwegian ports, enabling passengers to sample local specialities along with fresh meat and fish. Meanwhile, passengers on Holland America Line’s newest ship Koningsdam can get fresh at new farm-to-table style dinners in the Culinary Arts Centre, where chefs use just-picked micro-greens and Koppert Cress grown on-board. Or, you can even cook you own wholesome temptations as the popularity of on-board cooking classes is encouraging passengers to produce more healthy options. 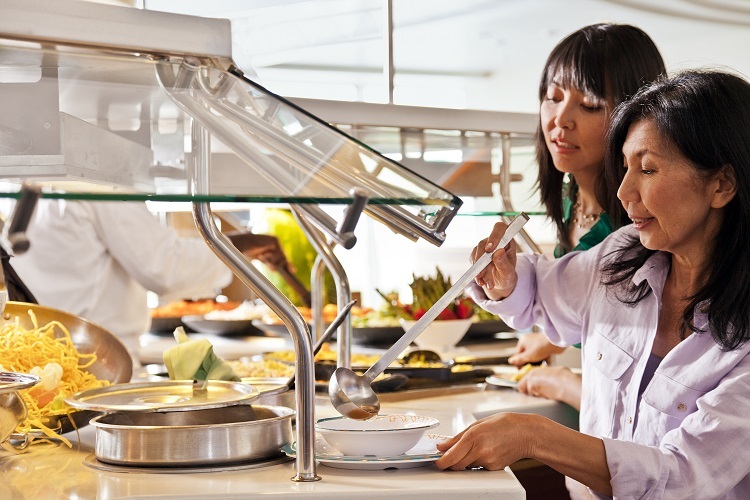 Cruisers can eat healthily on rivers, too, as lines offer a similar choice and some source ingredients locally, with Uniworld’s ‘Travelling Lite’ menus featuring reduced-calorie dishes, and AmaWaterways offering gluten-free snacks. Such a selection of healthy snacks and meals is enough to make anyone’s mouth water – and if you give in to temptation, at least you’ll have a clear conscience!